I am pleased to share with you the wisdom of NCAA Division 1 Women’s Soccer Coach of Cal State Bakersfield University, Gary Curneen. Gary Curneen became CSU Bakersfield’s women’s soccer head coach in 2014. Before beginning his tenure at CSU Bakersfield, Curneen coached at the University of Cincinnati for one year and at Wingate for 11 years. Along with an extensive background as a coach, coordinator, and recruiter, Coach Curneen is also an author. He has written two books; The Modern Soccer Coach 2014, A Four Dimensional Approach and The Modern Soccer Coach, Position Specific Training. Coach Curneen’s full bio is at the end of the interview. Keeping a strong line of communication is probably the most important aspect. If we have been getting a lot of emails from a recruit and our schedules work out, we will definitely go and see that player in action. Another way is communication through a club coach with a phone call or email with some feedback. I don’t think it’s ever too late. The landscape changes quite often and squad positions open up as late as the summer before the season. I think the biggest time however is the junior year. That is typically when most people commit and programs commit most of their scholarship budget. Getting discouraged if a coach does not respond to you. Once we are recruiting a player, we will look at their social media to see what they are posting. If it is negative, we may decide not to move forward with that player. My advice for recruits is to be careful and if it’s not positive, just keep it to yourself – the world probably doesn’t want to read it. CSUB Athletics reached their goal of a 3.0 cumulative GPA following the fall quarter. I think they have a big part to play by making sure emails and phone calls are responded to. Ultimately the relationship with the athlete is what players want to establish but parents can certainly help in the process. Seeing a player embrace a culture and start to change their lifestyle because of it. As a result, they become a more confident player and person. 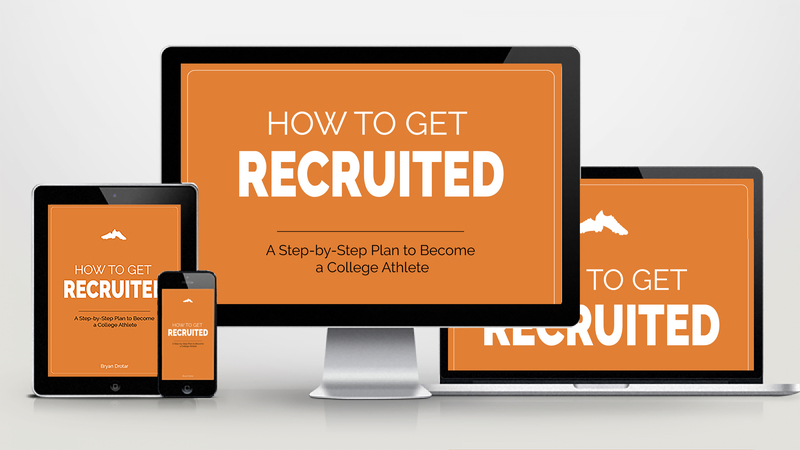 Next, take a look 4 Tips Toward a Great College Athletic Experience. Please take a moment to share it on social media, by clicking on the “sharing is caring” buttons below Coach Curneen’s profile. Gary Curneen became CSU Bakersfield’s women’s soccer head coach on Mar. 4, 2014. In his first year at CSUB, Curneen led the team to a 4-16-1 record and a trip to the Western Athletic Conference Tournament. Curneen’s team succeeded on the field and in the classroom as 11 ‘Runners earned WAC All-Academic team honors and two student-athletes were named to the All-WAC teams. Curneen joined the ‘Runners after spending the 2013 season as an assistant women’s soccer coach at the University of Cincinnati. In addition to his coaching duties for the Bearcats, he also served as the camp coordinator for the Cincinnati program. Prior to joining the Bearcats, Curneen spent the previous 11 seasons at his alma mater Wingate, serving for two seasons as an assistant with the men’s program before taking over as head coach of the women’s team. He led the Bulldogs to a 95-48-8 record in nine seasons at the helm. Curneen led the 2012 Wingate squad to a 14-3-1 overall record and their first NCAA Division II tournament at-large bid. The Bulldogs went 13-1-1 in the regular season, going 8-1 in conference play for the second straight year and advancing to the South Atlantic Conference championship match for the third straight season. 20 of Curneen’s student-athletes earned All-SAC honors during his Wingate tenure. The 2011 season was a historic year for Wingate, winning a program-record 16 matches. The Bulldogs went 16-4 on the year and defeated fifth-ranked Lenoir-Rhyne in the SAC championship match to earn their first SAC tournament title and, subsequently, their first NCAA Tournament bid. Curneen held the previous program-record mark of 14 wins set in 2008. In 2010, Curneen led the Bulldogs to a 13-3-3 overall record, and 7-1-1 in the SAC, which was good for a third-place finish in the conference, and their first appearance in the SAC tournament championship game. Along with an extensive background as a coach, coordinator, and recruiter, Curneen’s training and game methods have been chronicled in his book The Modern Soccer Coach 2014, A Four Dimensional Approach, which was released in November of 2013. Aimed at Soccer coaches of all levels and with players of all ages and abilities, The Modern Soccer Coach 2014 identifies the areas that must be targeted by coaches who want to maximize a team’s potential – the technical, tactical, physical, and mental sides to the game. In addition to his coaching ledger at Wingate, Curneen has served the Union County Soccer Association as a team trainer for various age groups (U-9 to U-16). He has been an assistant director in the Olympic Development Program for the North Carolina Youth Soccer Association (NCYSA), directing all aspects of training for U-11 girls. Curneen possesses an “A” coaching license from the Union of European Football Associations (UEFA). He holds the premier diploma from the National Soccer Coaches Association of America (NSCAA). Curneen was a marketing intern for the Boston Bulldogs of the A League and the Boston Renegades of the W-League for two summers. As a Bulldog student-athlete, Curneen earned four letters in men’s soccer for head coach Gary Hamill. Curneen helped Wingate earn its first NCAA Division II playoff berth in 1999. Curneen earned his bachelor’s and master’s degree (MBA) at Wingate University. Curneen, is a native of Omagh, Northern Ireland. He and his wife Erin were married in Northern Ireland in June of last year.